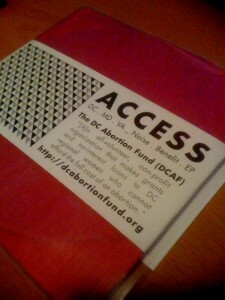 The Access Comp benefiting the DC Abortion Fund (DCAF) is now available. This compilation features BLK w/ BEAR, Layne Garrett, Grapefruit Experiment, Sandy Marshall, and Soft Pieces. GFX’s contribution is “Irigaray.” You can order the CDR from Zach Mason (Soft Pieces).